Bollywood produces highest number of film with annual output of 1986 feature film. 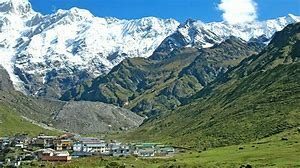 As a result producers are always in search for the perfect location with the stunning view at affordable cost.And one such place where Bollywood always prefer to shoot movies is KEDARNATH. Kedarnath has all those location which film demand. A lake named vasuki tal which is sky line silver and a window clear has a mob of flies rose into air and a sap sweet hug of air. Rudhari falls whose waterfall is aquarium blue which drizzle onto rocks which is varnish clear. Garhwal Himalaya range where snow are whale-bone white. And a perfect weather suitable for all types of mood.so many films has been shot in kedarnath namely shubh manglam savdhan, fitoor and upcoming movie itself with the name of kedarnath starred by sushant singh Rajput and sara ali khan . Samhills is one of the most popular agency in uttrakhand which provides not only location to shoot film but accommodation, transportation facility, location permits, camera and equipments.